A log of what I'm up to, esp kayaking year round, plus random stuff that catches my attention. 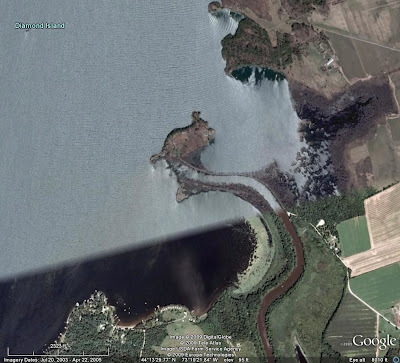 Over the years the Otter Creek has pushed enough sediment to form what looks like a canal with a levy on either side sticking out close to a mile from the shore of Lake Champlain. Yesterday we launched at the Fort Cassin boat ramp, located at the base of this extension. Fort Cassin was located out on the end, named for a navy Lt. Cassin in the war of 1812. Cassin commanded the fort with only 7 light cannon in a battle with British ships which were trying to prevent new American ships built upstream in Vergennes from entering the lake. "The rapid discharge of the guns was repeated in echoes from the rugged steeps of Split Rock Mountain till it became a continuous roar." (I'd guess echos were from the Palisades cliffs) The engagement lasted about an hour, then the British withdrew. The new ships were able to participate in the pivotal Battle of Plattsburgh. Between that and his role in the later battle Cassin was awarded a Congressional Medal of Honor. Our trip was a little less exciting, but had it's moments. Phelps brought a bunch of his paddles for us to try out. I got one I've named "Mr. Twitchy." The first stroke I took it dove and capsized me. Compared to my old paddle, it has a fine balance of enough cant to keep it from fluttering but not enough to make it slice down under the boat. It seems pretty fast though, and the white cedar has a nice look. Jane and Phelps at a rest (& rolling) break with a couple of his paddles. The diving mask on Phelps's boat was brought in case we went by Thompson's Point, where a bike he was riding fell through the ice last winter. I'm not sure if he had a plan to retrieve the bike and carry it on the kayak, or just look for it. On the way back from the NY side, a group of large powerboats went flying by heading south. A few minutes later we could hear the wakes crashing against the palisades. Not quite like cannon fire, but pretty loud for being over a mile away. A few minutes after that the east bound wakes hit us for a little boost.